The best romantic birthday wishes can make your fiancé, lover, wife, husband, girlfriend or boyfriend feel extra-special and extra-attractive, just like the birthday messages on this page. If it was me (well, the "single me" from years ago), I would want a love birthday message with the right dose of passion, affection, tenderness and commitment, particularly in light of today's online dating circus. A little passion, affection, tenderness and commitment can go a long way nowadays. 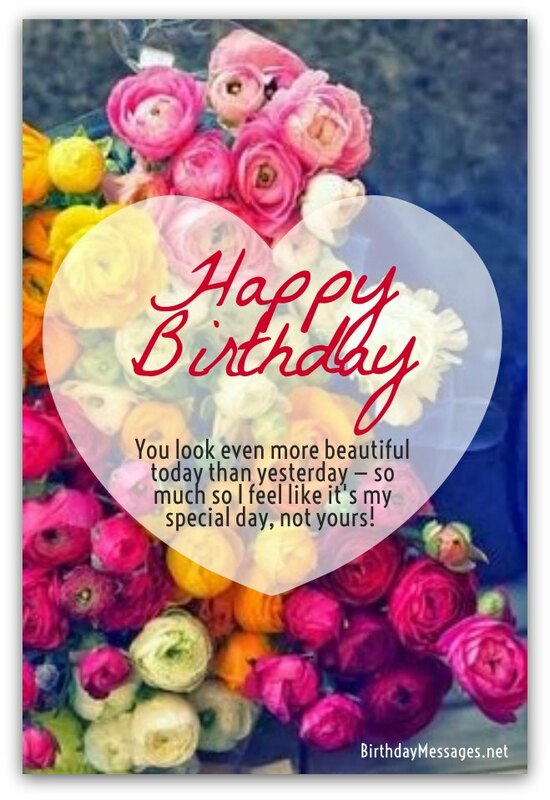 Here, you'll find romantic birthday greetings that can cut through all the clutter and truly set the right mood for your special someone's special day (when the right mood counts most). Happy birthday. Even though today makes you one year older than yesterday, you just keep getting younger and more beautiful in my eyes every day. Your friends and family may show you how much they love you on your birthday, but nobody can love you nearly as well or as much as me! Happy birthday, lover! My sweet flower, blossoming in any lush garden where undying love and pure passion grow is you! On your birthday, let’s make our love bloom! Happy birthday! You look even more beautiful today than yesterday — so much so I feel like it's my special day, not yours! I hope you know how much I love you and our time together. There is no better way to let you know than showing you on your birthday. Let's have the time of our lives today. Happy birthday, dear! This message comes with no sugar, no artificial coloring and no additives. It’s all natural, including my love for you! Happy birthday, lover! No card, no message can be as sweet as the person reading it! You're my sweetie! Happy birthday, sweetheart. Happy birthday. 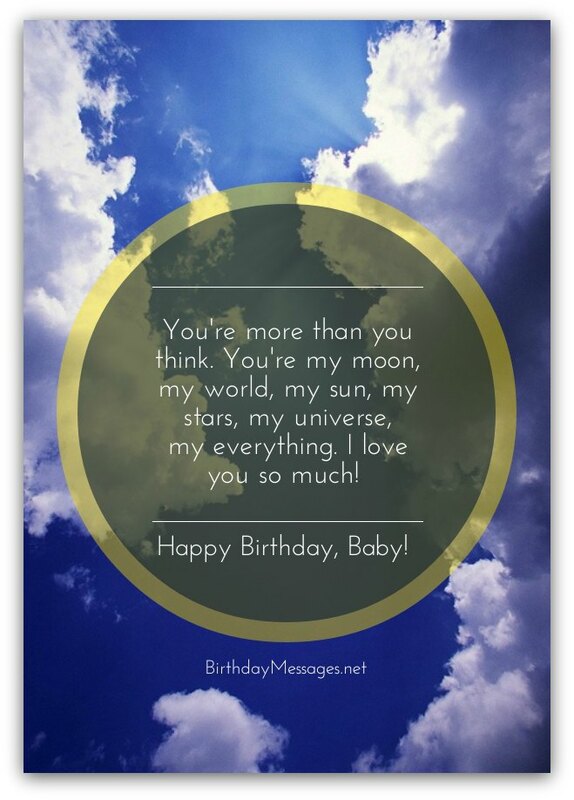 I love you so much that I've named a star in the sky after you — it's my birthday gift for you. I call it REAL LOVE, like we have. With this birthday wish comes my heart and soul, wrapped with oodles of smiles, hugs, kisses and love. On your birthday, let's celebrate our past, our present and our future! I love my life with you...today and every day! Happy birthday, baby! Our best years together lie ahead of us. Let’s make the most of today and tomorrow. Let's make your birthday the best ever. I love you. You're more than you think. You're my moon, my world, my sun, my stars, my universe, my everything. I love you so much! Happy birthday, baby! Happy birthday, my darling! May today be more wonderful than any moment of love, laughter and joy we've ever shared to the power of 10. Happy birthday, my love! Your special day would not be complete if I didn't let you know how much you mean to me. So... You're not the love of my life — you are my love for eternity. Wherever, whenever, you are my sunshine. Day after day, your love shines upon me, warming (no, melting) my heart. Happy birthday, baby! Happy birthday! You deserve all happiness and love in the world — and I want to give it to you every day, especially on your special day (like right now). My love for you grows with every passing day (not just on your birthday). I love you a zillion and one times more today than yesterday but nowhere near as tomorrow.